Real Madrid v Manchester United - Key Points | The Real Madrid Fan! With less than 4 hours to go for Real Madrid and Manchester United to take centre stage at the Bernabeu, in what is the tie of the stage, we look at some of the numbers around both teams and the key points going into a key first leg. 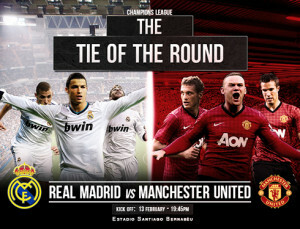 Real Madrid and Manchester United have faced each other eight times (four ties) with two ties being quarter-finals and two being semi-finals. Real Madrid picked up three wins, three draws and two losses. At home (either Chamartin stadium or at the Bernabeu) there have been four matches with Real winning two and drawing two. Real have not lost at home to Manchester United. In three out of four ties between the two teams, the winner has gone on to lift the trophy in the end. In 1957/58 and 1999/00, Real won the competition while in 1967/68, Manchester United won the title. In 2002/03, Real were the winners of the tie but lost in the next round. When facing English teams in Spain, Real have played 12, won 6, drawn 4 and lost two. The recent meetings have been against Manchester City (in group stages, Real won 3-2 with a late Critsiano goal) and Tottenham Hostpur (in 2011 quarter-finals, won 4-0 with goals from Adebayor, Di Maria and Cristiano). The only two losses have come against Liverpool in 2009 (0-1) and Arsenal in 2006 (0-1). When facing Spanish teams in Spain, Manchester United have played 20 games, won two, drawn 8 and lost 10. Their previous games in recent past have been against Athletic Club de Bilbao (Europa League in 2011/12 with Athletic winning 2-1 at San Mames), Valencia (in 2010 Champions League with 1-0 to United at Mestalla). Before that United played three 0-0 draws in Villarreal and twice in Barcelona. The only wins have come against Deportivo La Coruna and Valencia. Jose Mourinho has named a strong 22 man squad for the game tonight. The only absentees include Iker Casillas, Nacho Fernandez and Alvaro Morata. Pepe is back into the squad after his injury and having played a few minutes on the weekend against Sevilla. Xabi Alonso and Raphael Varane are both in the squad even though they sat out the game due to injury. Alonso is the bigger worry as he is speculated to play through the pain. Sir Alex also has a fully fit squad at his disposal. Only player who has not travelled to Madrid is Paul Scholes due to a knee injury. Both Johnny Evans and Phil Jones are into the squad despite picking up knocks in the past week. Jones could be handed the difficult task of man marking Cristiano Ronaldo. Real Madrid haven't lost at home in 33 games or since 18 January 2012. The last loss came against Barcelona (2-1 in the Copa del Rey). This winning streak is the longest among the top leagues in Europe (Spain, Germany, Italy, England, France, Portugual and Netherlands). Real are also the only European side to have gone without losing at home in more than a year. Porto, Barcelona and Atletico Madrid have under a year. Real have won eight out the last nine UEFA Champions League fixtures at home. Played a 2-2 draw with Borussia Dortmund on matchday four. Quite possibly the biggest highlight of the game would be Cristiano Ronaldo facing his ex-team Manchester United. Cristiano played six seasons with United scoring 118 goals in 292 games (average of 0.40) winning one Champions League medal, three Premier Leagues, one FA Cup and two League Cups. Cristiano has played two Champions League finals with United. He scored in the 1-1 draw against Chelsea where United won on penalties, although Cristiano missed his spot kick. Next appearance was twelve months later against Barcelona with the Spaniards winning in Rome. Cristiano has six goals in six games this season's competition (same as Galatasaray's Burak Yılmaz). He has scored fifteen goals in last thirteen appearances. Cristiano played every minute of Real's group stages has 27 shots on target, more than any other player. He also has more shots than Robin Van Persie, Wayne Rooney and Javier 'Chicharito' Hernandez combined (24). Not only is it a clash of titans on the pitch, it will be a battle of tactics and mind-games. Jose Mourinho would go up against the legendary Sir Alex. Many reports had claimed Old Trafford would be Mourinho's next destination should Ferguson retire but Jose rubbished those suggestions in his press conference yesterday. Mourinho has faced United twice before at this stage of the competition. First was with Porto with the Portuguese side winning 2-1 in Portugal before wrapping up the tie 3-2 on aggregate. The highlight of the tie would be Mourinho's run down the touchline when Porto scored at Old Trafford. Porto were winners that year. After Mourinho's Chelsea reign, he faced United in the round of 16 with Inter Milan with United winning the tie. Inter lost 2-0 on aggregate with both goals coming at Old Trafford. As Chelsea manager, Mourinho's record against United stands at W5, D4 and lost 1. In the group stages, Real scored (15 goals, same as Bayern Munich) and conceded (9 goals) more than any other team in the round of 16. Seven of Madrid's goals came from outside the box. Arbeloa comes in having served a suspension but Alonso and Ramos are one card away from suspension. United lost two in a row in their final group games. If they lose tonight, it would be their first three losses in a row since 2004/05. United collected only seven yellow cards in the group stages and have no player nearing suspension. United have trailed in 18 of 36 matches this season but only lost six. Additionally, the goalkeeping position hasn't been fixed with nine clean sheets this season.